"Oh, Goody! . . . Goody! . . . GOODY! This is going to be such a wonderful day! I just know it! I do. I do. I DO!" Murple squealed, as Jimmy took his little coat out of the closet and put it on to wear that day. "I'm sooo happy to be out of that dark closet! But at least it wasn't nearly as bad as being in the pocket," Murple said to herself, since no one could hear her tiny little voice. "You mean, you had to spend time in that pocket, too?" Murple was quite startled to hear someone speaking to her. "I must be hearing things! I thought I heard another teeny tiny voice," Murple said aloud, but not nearly loud enough for a human to hear. "Hee, hee, hee . . ." Murple heard two tiny voices laughing. "Hey! Who are you? And where are you? And why can you hear me? And why do you have such a teeny tiny voice like me?" The questions rolled out of Murple's little mouth almost faster than she could think of them. The laughing continued. "We're flurples just like you, and we're stuck to this coat sleeve, too. It sure is sticky, and it sure is icky," the little voices rhymed in unison. Murple nodded in agreement even though she still could not see who was talking to her. When Jimmy walked outside into the sunshine, Murple squinted her eyes and looked carefully. After her eyes adjusted to the sunlight, to her great delight she saw two little, blue fuzz balls that looked pretty much like her. They explained that they had been knocked onto the coat when the boy's father had put his hat in the closet, and now they were stuck there with her. "This is going to be tons of fun! It is! It is! IT IS!" Murple joyfully exclaimed. "Now I don't have to talk to myself, and that makes me happy . . . happy . . . HAPPY!" she laughed. "Where do think we are going?" the little blue twins asked Murple. "Wherever Jimmy takes us," Murple replied with a grin. It didn't really matter to her where they were going. What mattered was that she was out of that dark closet and into the sunshine, and she was as happy as a little purple ball of fuzz could be. The little blue twins looked up just in time to see some buildings that they recognized. They had seen these same buildings one day when they were traveling on top of the man's hat. "OH, BOY! I think we are going to Capernaum," one of them said. "Cap. . . Cap . . . CAP . . . what?" Murple asked. "Cap-er-na-um," the twins said together. "You mean, you've never heard of Capernaum?" they asked. Then they continued talking excitedly. "Capernaum is where Jesus lives. He moved there from Nazareth. All sorts of things happen in Capernaum!" "You mean, we might get to see JESUS?" Murple squealed loudly. "Oooh, Oooh, OOOH! I just love JESUS! I was in His carpenter shop for a while, and then later on, I got to see him turn water into wine!" She was so excited, she almost couldn't stay still. "We're going to Cap-er-na-um, We're going to Cap-er-na-um," she started singing, and the blue twins joined her in song. "We're going to Cap-er-na-um. We're going to . . ."
"Listen . . . listen . . . LISTEN!" Murple squealed. "I think it's Him! . . . I think it's Him! . . . I really think it's HIM!" They all perked up their teeny tiny ears and listened closely. "Jesus, please . . .Jesus, will you please come to my house?" they heard a man beg. "It IS Jesus!" all three flurples exclaimed at the same time. "And that man is Jairus. He's an important ruler at the synagogue," the blue twins explained to Murple . . . Then they kept listening carefully because they didn't want miss anything Jesus might say or do. "Please, Jesus. I need you to come to my house. My daughter is very, very sick. There is no hope for her. If you don't come, she will certainly die," Jairus begged. 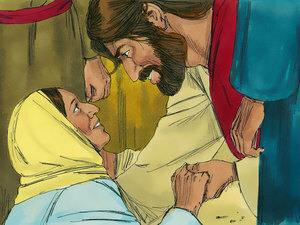 Jesus was full of compassion for people who had great needs, and He started right away to follow Jairus to his house. But as they were walking down the road, there was interruption. Another woman who was very sick needed Jesus, too. She pushed her way into the crowd and tried to touch Jesus. Other people were crowded around and nearly stepping on her, but she didn't give up. "Oh, if only I could touch his clothes," she kept saying over and over to herself. Finally she had inched her way through the crowd enough to barely be able to reach out and touch the hem of His robe. "Who touched me?" Jesus questioned. Murple didn't understand that question one bit. "'Who touched me?' What does He mean by that?" she wondered. "Everybody is touching Him! The whole crowd is touching him!" Murple and the blue twins were puzzled by these strange words of Jesus, but they kept watching. The sick woman in the crowd that had pushed her way through to touch Jesus, knew exactly what He meant and she became fearful. In those days it was against the law for sick people to touch other people, because there weren't very many medicines and diseases were easily spread. She bowed on the street at Jesus' feet and told Him her story about being sick for 12 years and how none of the doctors could help her. She confessed that she was the one that had touched Him. Jesus turned to her and gently said, "Go on your way and don't be afraid. You won't be sick any longer." "WOW! We just saw another miracle!" The flurples exclaimed as they saw the woman go down the road rejoicing. "That sure is a happy lady!" Then Murple caught a glimpse of Jairus and she became sad. "That man Jairus is not very happy," she said. "Just look at his sad face. I hope Jesus goes to his house. I hope. I hope. I HOPE!" she said. But as she saw the huge crowd that had gathered around Jesus, she was doubting that He could get there. She just didn't see any way He could get through that huge group of people. Just then Murple heard something that made her very, very sad. "There's no reason to bother Jesus any longer," a servant said to the ruler. "Your daughter has died." "No! No! NO!" Murple sighed. "THAT can't happen! Jesus was supposed to go help his little girl. Now it's too late. . . It's just too, too, too, late." Big tears welled up in Murple's tiny eyes. 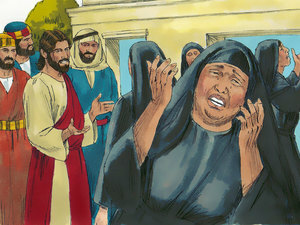 Although they were happy that they had just seen Jesus heal the sick woman, the flurples were feeling sad and disappointed that the little girl had died. "It's not over yet! . . . Listen!" the blue twins told Murple. Jesus had heard what the servant said to Jairus. "Fear not: believe only, and she shall be made whole," they heard Jesus say as He comforted Jairus. Then they heard Him speak to His friends. "Peter, James, John," He said. "Make sure no one follows us. We are going to Jairus' house." All of a sudden, Murple's saddness and disappointment disappeared. "Yea! Yea! Yea!" she squealed, at the top of her little voice. 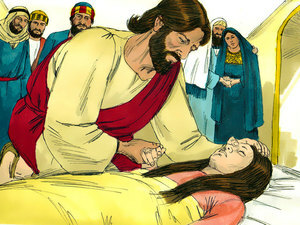 "Jesus is going to help the little girl. He can . . . he can . . . I know he can! I hope we get to see what happens. I hope Jimmy follows Jesus. I want to see!" "We want to see, too!" the blue twins chimed in. Luckily for the flurples, Jimmy wanted to see too. Even though Jesus had said He didn't want anyone to follow them, Jimmy just couldn't help himself. He knew where the synagogue was and he knew where Jairus lived, and he knew a special way he could go watch without being in the way. When Jesus and Jairus got near the house, there was a loud, sad noise that greeted them. People were standing all around, weeping and crying for the little girl that had died just a few minutes earlier. "Why are you crying and making all this noise?" Jesus asked them. "The little girl is not dead. She is only asleep," He continued. 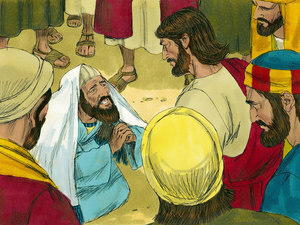 The crowd of mourners became angry at Jesus and started making fun of Him. "We've been here the whole time and we know she's dead!" they exclaimed. "You just got here and haven't even been inside the house yet. You don't know what you're talking about!" "Uh-oh . . . Uh-oh . . . Uh-oh!" Murple cried out. "This could be biggggg trroubbble! That crowd is mad, mad, mad!" But there was no real trouble. Jesus didn't let the angry people bother him. He had been around angry crowds before and knew how to handle them. 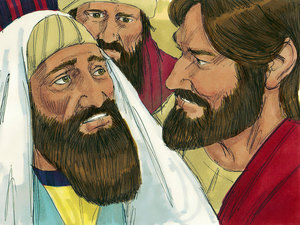 The flurples watched as Jesus, Peter, James, and John worked their way through the crowd and went inside the house. "What is He going to do? WHAT is He going to do?" all the flurples wondered, as they watched the door of house close. "It's impossible. It's just impossible!" Murple said with great disappointment. "The door is closed and now we can't see. We'll never . . . never . . . never know the end of this story," she pouted. Just as they had given up all hope of looking in on what was happening, Jimmy spotted a small tree right outside a window of the house. He was up that tree in a flash, and this time the flurples were glad they were stuck like glue to Jimmy's sleeve and didn't fall off. 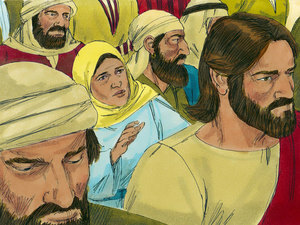 Peeping through the window, they all watched as Jesus took the little girl by the hand and said, "Talitha, cumi," which means, "Little Maid, get up." Immediately, the little girl opened her eyes. . . She slid over to the side of her bed. . . She put her feet on the floor. . . And . . . the flurples watched in wided-eyed amazement as the little girl, who had been lying there dead, stood up and walked! Everyone was jumping and singing and clapping for joy, because Jesus gave life back to the young girl. But in their joy, they seemed to have forgotten her. 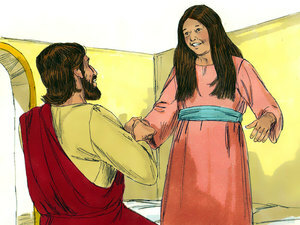 Jesus told the little girl's parents to give her something to eat. Then He said something that seemed a bit odd. "Don't tell anyone about this," He said. "Don't tell anyone?" Murple questioned. "How can they just not tell anyone? This is the most joyous miracle this family has ever seen!" she exclaimed full of excitement. "How can Jesus expect them not to tell anybody? I'll tell you one thing," she kept chattering. "I surely wouldn't be able to keep something like this a secret for very long!" The blue twins also agreed. 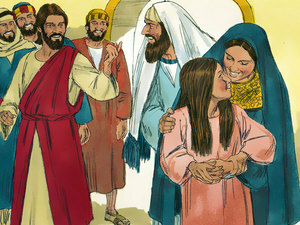 They all watched as Jesus wrapped His arms of love around the little girl and gave her a big hug. Then they watched as He and His three friends walked quietly down the street. They could hardly believe what an adventurous day it had been. They had seen Jesus perform not one, but two miracles that day, and Murple knew that she would remember it forever . . . and ever . . . and ever! What was the first miracle? What did Jesus say to the little girl who was dead? What was the second miracle? Jesus loves everyone and has great compassion for all people. "Fear not: believe only, and she shall be made whole" (Luke 8:50b). in Your love and in Your great power.